The No. 1 choice for ITIL-aligned service management processes. Used by the most demanding IT organizations in the world – and built to extend and scale, Remedy is far more than just a service desk. With the full span of ITSM processes, you’re aligned with ITIL-compliant best practices from day one. Even your most demanding customers will appreciate the modern, easy to use self-service portal and our new virtual agent capability. 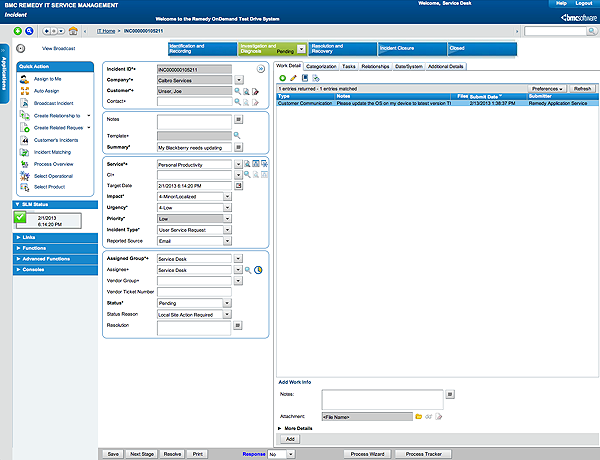 You can also collaborate and communicate more effectively with the integration of social media capabilities in ITSM 8.0. 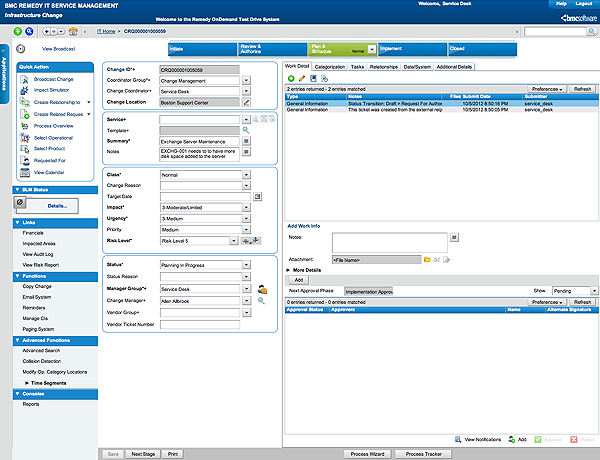 Using our new ITSM process designer, you can configure all processes and workflows in the application quickly and easily. With point-and-click editing, you can respond to the changing requirements of the business more rapidly and without the need to consume precious technical resources. Make it easy for your customers to get the service and information they need from IT. Keep them productive with easy access to useful knowledge base articles, important updates and key services tailored to their role. 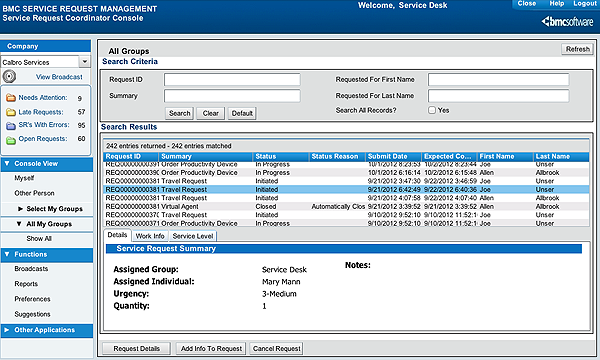 Reduce your IT support staff workload and maximize process efficiency, with configurable and automated service request workflows. Deliver faster, more responsive support and build a powerful foundation for your enterprise service desk, with ITIL® aligned Incident and Problem management. Maximize the productivity of your agents and reduce resolution times with intelligent ticketing, incident matching and unrivalled visibility into other ITSM processes and the CMDB. Maximize business agility, minimize your operational risks and introduce new levels of process rigor and accountability. With a unique depth of integration into other ITSM processes, change collision detection, powerful work management capabilities, approval matrix modeling and “what-if” analysis, you’ll benefit from the most capable change and release management solution available. Get better visibility, compliance and control of your technology infrastructure.Understand the full lifecycle of your IT assets, from purchase to retirement with multiple financial models and analyses. 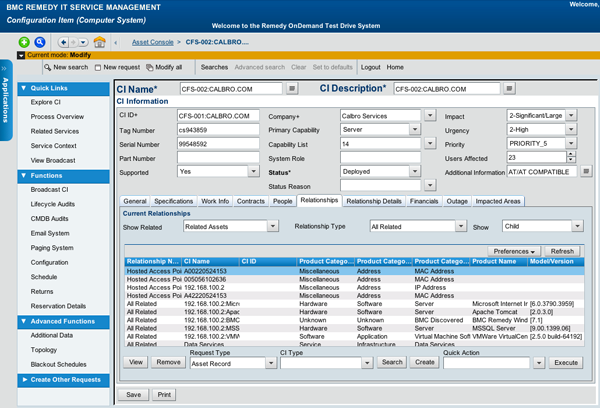 Capture and automatically enforce your key contracts and warranties, and eliminate unwanted costs with a comprehensive software license management capability. Ensure your business customers enjoy the very highest levels of service. Model and enforce SLAs, OLAs and Underpinning Contracts, from the simple to the highly complex. Create and adapt agreements quickly and easily with point and click editing. 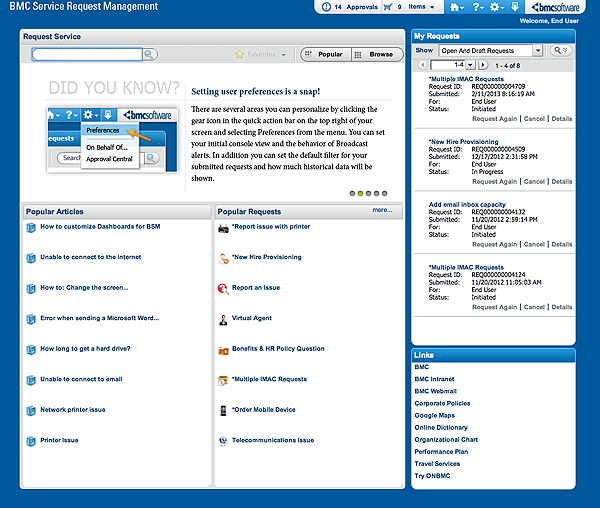 Automate monitoring, alarms and escalations in any ITSM process and integrate to other IT operations management systems. Build the ultimate decision platform for your ITSM organization. 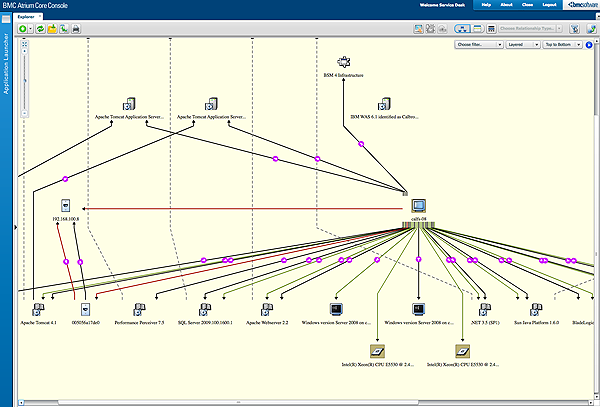 Model your business services, infrastructure and dependencies in the BMC Atrium CMDB and share the information across key ITSM processes and other IT operations disciplines. Maximize the accuracy and value of your CMDB with seamless integration into the BMC application discovery and dependency solution. When you’re ready to branch out, you can take advantage of integrations into: portfolio management, vendor relationship management, systems monitoring, capacity management and much more. Thanks to a huge range of standard integrations and shared Atrium CMDB data, you can build an extensive and fully integrated IT operations management (ITOM) platform. Choosing Remedy OnDemand gives you the same powerful functionality as Remedy On-Premise, plus the additional benefits of SaaS delivery. You’ll have lower, more predictable operating costs and less to think about when it comes to maintenance and upgrades. With no hardware or software to buy or manage, you will quickly get value from Remedy OnDemand. Once up and running, your solution is managed by BMC’s global network and security operations centers, allowing you to focus on providing IT results for the business. With Remedy OnDemand, you are always on the latest version, taking full advantage of new innovations. No more resource-hungry roll-outs or complex infrastructure upgrades to worry about — your customizations and configurations are always preserved in Remedy OnDemand. Grab the drag-and-drop process designer and shape the workflows to fit your business needs. 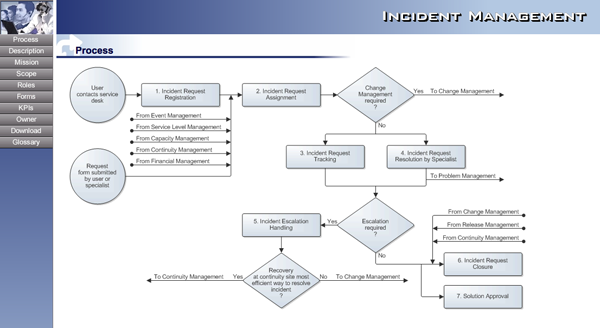 Rest assured that the security of your ITSM system is our top priority. No expense has been spared in ensuring our hosting facilities and systems are protected by extensive, multi-layered security. With Tier III- certified hosting locations, powerful data protection and encryption, an ultra robust network infrastructure and comprehensive application security, – nothing is left to chance. Please send me more valuable information about this product. Remedy ITSM gives you the flexibility to choose the right delivery method for your organization — whether you’re looking to embrace the reduced operating costs of the cloud, or need the additional control and visibility of an on-premise solution. © Copyright 2005-2013 BMC Software, Inc.